In today’s Hygiene conscious society Diapers are used from the day a baby is born. Diapers are used by every class of the family and for every infant to keep the surrounding area clean by preventing babies from wetting the bed while sleeping or during their daily activities. However, a baby’s skin is very delicate. Lify diapers allow babies to sleep peacefully and play comfortably day or night. 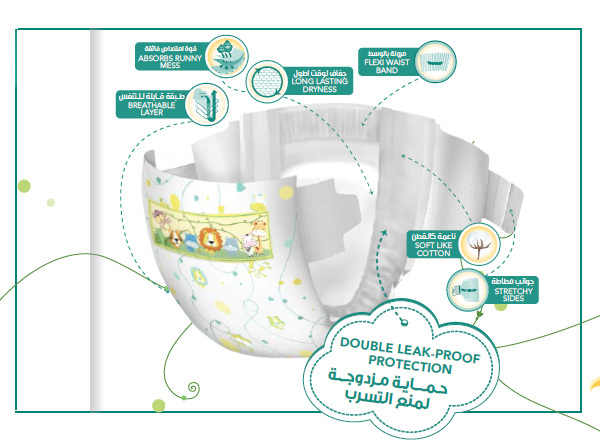 With the aim of helping mothers and babies enjoy the early years in comfort, Hygiene Product Factory WLL treats diapers as baby underwear rather than a piece of equipment, and offers products such as disposable baby diapers in all size that will appeal to mothers and babies alike. Our LIFY brand is Qatar’s 1st Hygiene care product in the country made with extensive Research & Development and made from first class technology, making it convenient and comfortable, which helps you enjoy the childcare experience to the fullest.